NASA bid a bittersweet farewell to its Kepler spacecraft in October. During its nine-and-a-half year journey, the space telescope spotted more than 2,600 planets outside of our solar system. Not bad for a mission that was initially expected to last 3.5 years. And retirement didn’t stop it from beaming back additional discoveries in the new year, among them a previously overlooked gas-rich world similar to Neptune, a super Earth and a Saturn-sized body orbiting a Sun-like star. 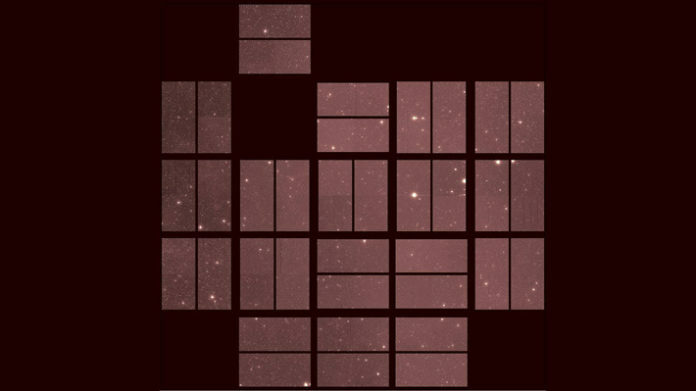 But now the space agency has shared Kepler’s “last light” image taken on September 25th. NASA claims the view marks the craft’s final record before it ran out of fuel roughly a month later. As for what it shows, Kepler was pointed in the direction of the constellation Aquarius when it captured the image. It includes a peep at the renowned TRAPPIST-1 system, located 39.6 light-years from the Sun, and its seven Earth-sized planets including three in the life-supporting “habitable zone.” In addition, the telescope caught a glimpse of the GJ 9827 system, a nearby bright star that hosts three super Earths (which Kepler itself first detected in 2017). Its final field of view also slightly overlapped with its successor, the new planet-hunter TESS (Transiting Exoplanet Survey Satellite). This, claimed the space agency, will give astronomers the chance to compare and improve on their understanding of the data received from the two spacecrafts. As usual, mechanical niggles got in the way: NASA said the blackened parts at the center and along the top of the image were caused by earlier random part failures in Kepler’s camera. After taking its final snapshot, Kepler continued recording specific targets every 30 minutes for the next few hours.